The V90 police car will take to the streets in 2017. You can probably run, but you can’t hide from the beauty of this Volvo V90 police car. The newest member of the Swedish police fleet, the V90 wagon scored the highest rating ever in the demanding police driving test, besting the former XC70. Excelling in five crucial areas, the brake test, obstacle course, evasive action test, and high-speed emergency driving, the V90 scored an overall 9.2 out of 10. "It is difficult to find any faults at all," said Swedish police test drivers. "Chassis, steering, suspension, traction control and powertrain all show exemplary performance." In order to achieve such an impressive score, Volvo engineers at the Special Products department in Torslanda, Sweden, went to work on assuring this V90 was ready for duty. The chassis was stiffened, the brakes and suspension were improved, and the interior was equipped with all the necessary tools and technology one might need while on duty. Though the company doesn’t specify what kind of engine is under the hood, it's safe to assume it’s the base 250-horsepower (186-kilowatt) turbocharged four-cylinder as opposed to the more premium twin-charged four-cylinder unit. Though, officers would likely make use of all 316 available horses (235 kilowatts) and 5.3-second 0-60 mph (0-96 kmh) time. 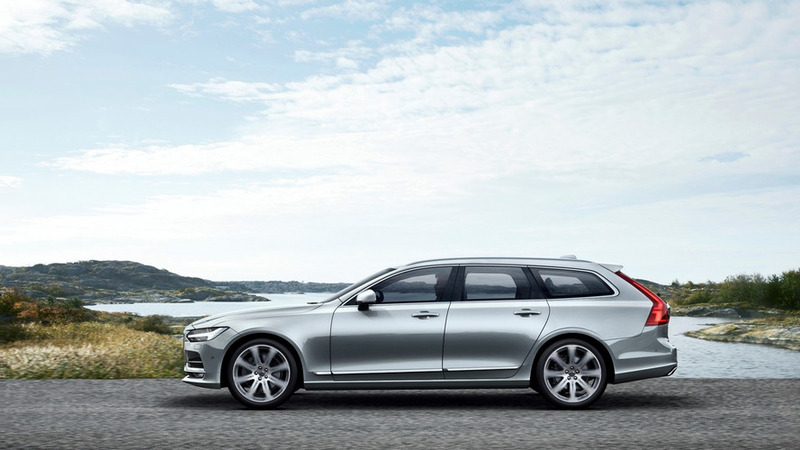 While the Swedish police will be the first task force to officially use the V90 wagon, Volvo hopes other police forces will follow suit – not just in Europe, but around the world. Countries like Norway, Italy, the U.K., and the Netherlands have all used Volvo vehicles in the past, as far back as 1929. The Volvo V90 police vehicle will begin deliveries next year. 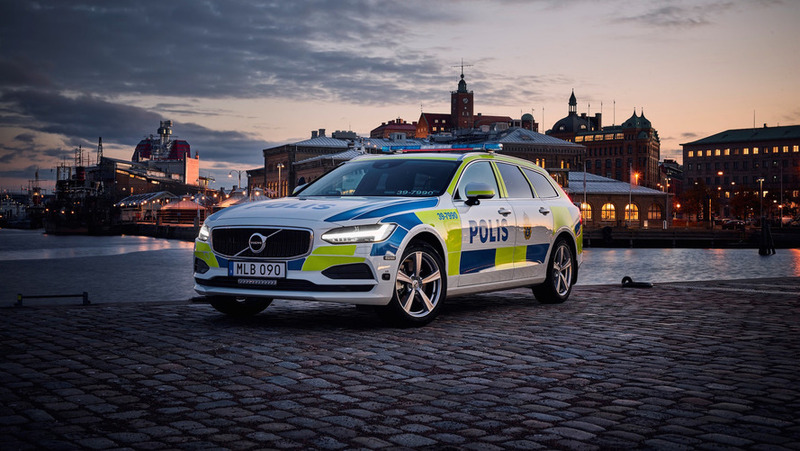 The Swedish police will take delivery of its first V90 police cars early next year after the car recently achieved the highest rating ever in the Swedish police’s highly demanding driving test. The demands on emergency vehicles are higher than on normal road cars. On top of that, unlike in many other countries, in Sweden the police car is judged as a workplace. This means any car has to meet very strict demands in areas such as performance, comfort, quality and ergonomics in order to qualify as a police car. 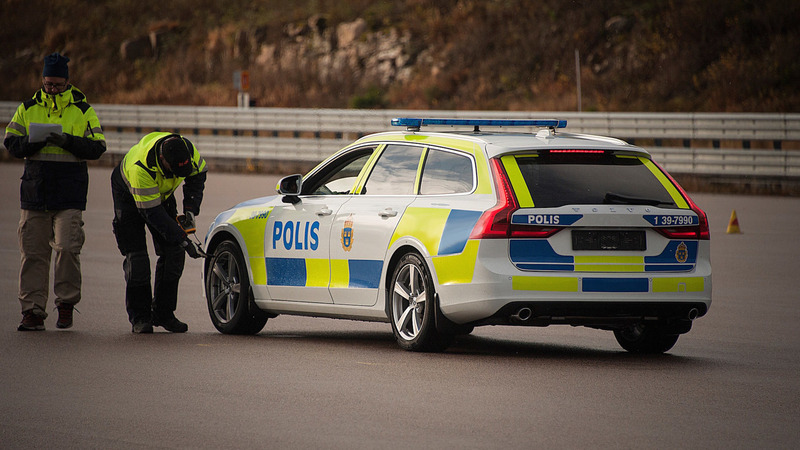 The Swedish police car test focuses on five areas: a brake test, an obstacle course, evasive action tests with and without breaking, and high-speed emergency driving. The overall score for the V90 was 9.2 out of 10, the highest rating ever achieved by any car in this demanding test. While the Swedish police will be the first to start using the V90, Volvo Cars sells its police cars in other countries as well. Other police forces that in recent years have used Volvos include Norway, Italy, the UK and the Netherlands. The V90, too, will be made available to any interested police forces around the globe. With the V90 police car, Volvo takes the highly refined driving experience of the award-winning standard V90 to the next level. To transform the premium estate into a suitable emergency vehicle, the Volvo Car Special Products department further develop the car to meet the specific demands of police forces. For instance, the chassis is made stronger and more dynamic, the brakes and suspension are improved and the car is fully equipped with all necessary tools and communication equipment. It takes about a week to transform a standard V90 into a police car at Volvo Cars’ special manufacturing facility in Torslanda, Sweden. Volvo Cars has a long history in providing police cars: already in 1929 Swedish police fought crime from behind the wheel of a Volvo. In the decades that followed, classic Volvos such as the Amazon and the 144 also served in police uniform. More recently, the XC70 and V70 estates have been used by police forces. The XC70, too, was the best police car ever tested by Swedish police at the time of its introduction.